The Event Pro Admin system is a time saving tool providing increased efficiency in creating the coach’s packets, as well as a highly optimized system for organizing event data (Players, Teams, Games). For certified events, the data from the NCAA website is processed by the Event Pro Admin system and validated to the NCAA rules and presents it in a format to easily identify and correct any potential violations. This also eliminates manually cutting and pasting rosters into a document. Each event will have a separate, independent desktop system with a fully searchable database of all the players, coaches, and teams in your event that can be easily exported for future use by your staff. The Scoring Pro iPad app provides and easy, paperless alternative for keeping the official book. Rosters are imported from the Event Pro Admin system, to ensure all players checking in to the game are registered to play in the event. Once game scores are submitted, they automatically advance teams and game results are published on your website. The Online Roster Management system enables teams to enter their rosters online prior to the event. Teams will be able to log in with a password to add, edit, activate, or de-activate players on their team. These rosters are maintained in the Event Pro Admin system, and can be used in the Scoring Pro iPad app. The Event Pro Admin Scheduling Module allows you control of the schedule while allowing maximum efficiency by never double entering. Once the schedule is set, reports are generated for team, pool, and court schedules for your use or to publish on your website. The Event Pro Admin Schedule Module also seamlessly integrates with the Event Pro coach’s app and Scoring Pro iPad app. By partnering with Event Pro Sports, your event will be highlighted in personalized, state of the art emails to over 3,000 college coaches promoting the partnership with Event Pro Sports. The Event Pro app provides cutting edge, next generation technology to college coaches and evaluators, pushing your event to the forefront of modern recruiting. Contact Event Pro Sports for contract and pricing information for the use of Event Pro at your next event. Email sent to an extensive list of college coaches, from all levels, with the details and highlights of your event and also indicating your event will be utilizing the Event Pro app. Easily generate a PDF of your entire coach’s packet to be sent to your printer. For NCAA Certified events, eliminate manually cutting and pasting to assemble rosters for the coach’s packets. Our system has automated the process so it can be done in minutes rather than days. Allow coaches to pre-purchase and download the Event Pro app in advance, with no shipping costs. Enable coaches to plan their time prior to your event, while eliminating the risk of your packet being copied. Have a fully searchable database of all the players, coaches, and teams that participate in your event. Provide schedule and roster updates to the college coaches and evaluators using the Event Pro app throughout the duration of your event. Each licensed app is locked to only one device for a limited period of time. Built-in security features to ensure data is not printed or exported prior to the conclusion of the event. System hosted on our secure server with password protected access for your staff. Easy, one-touch scoring and statistics iPad app. Allows you to keep the book electronically and automatically advance teams in bracket play. Ensures that non-registered players are not participating. Automatically publishes game results online and updates the coach’s app schedule. Allows teams to enter rosters online prior to the event. Rosters are utilized in the Scoring Pro Module. Team Admin is able to log in with a password. Players can be added and information for existing players can be edited. Players can be activated or deactivated for each event without having to re-enter all of their information. If starting in pool play, assign pool codes to each team – generates all corresponding pool play matchups. Place specific matchups in the correct game time slots. Generation of your complete schedule in multiple report formats (team schedule, court schedule, pool or division schedule and standings, etc.). All schedules and brackets are automatically published to the web to be linked to your event website. Download the text file from the NCAA website (when available). Copy and paste the NCAA data into the Event Pro Admin system (for certified events). "Generate Coach's Packet" to provide a PDF to your printer. Assign each team their pool and /or team code which will be used in the Event Pro Admin Scheduling Module. Utilize the Event Pro Admin Scheduling Module or work with Event Pro Sports to have your tournament schedule integrated. Allow teams to enter rosters online prior to the event (certified or non-certified) using the Online Roster Management. Rosters are maintained in the Event Pro Admin system. Make player, teams, and game updates available for coaches to download as they are made. Use the easy, one-touch Scoring Pro iPad app to keep the book electronically and automatically advance teams in bracket play and automatically publish scores and schedule updates on the web to be linked on your event website. Enter in game scores in the Event Pro Admin Scheduling Module (or utilize the Scoring Pro iPad app) and resulting pool standings and bracket games are auto-populated and published online. The system will be available for a limited period of time after the event has concluded to find and export any data needed for future use by your staff. 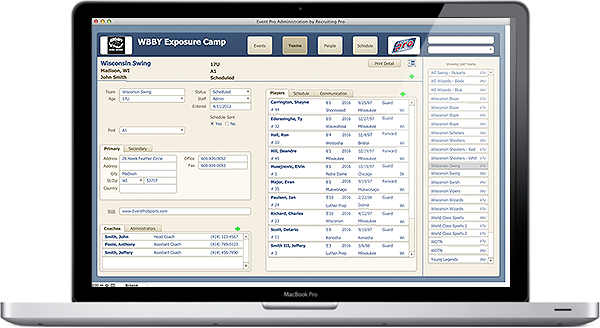 Example Exports: email lists of administrators at your event, participating player lists, head coaches list, etc.